The Black Steel 25 Bottle Stackable Grid. For those who favor the sleek and chic. Heavy-Gauge metal with a powder coat to protect against rust. Holds up to 25 Standard Bordeaux Bottles. what is a Bordeaux bottle, or how is it different from, say, a Cabernet Sauvignon bottle or any other "regular" sized bottle? I like this Grid, but want to be sure what we drink will fit into it. BEST ANSWER: A "Bordeaux Bottle" is high shouldered and is used by the majority of wineries for Cabernet Sauvignon, Merlot, Cabernet franc, Malbec and most Bordeaux blends. The other "Burgundy Bottle" is a slope shouldered bottle that is used my most wineries for chardonnay and pinot noir. So basically, a "Bordeaux Bottle" is a standard wine bottle. Does this rack have to be assembled? Nope! It comes fully assembled, however, if you are ordering more than one and want to stack them, that does require a screwdriver to attach them together. It comes with the screws, by the way. Thank you - good news! The Black Steel 25 Bottle Stackable Grid already comes fully assembled. You can unpack it and begin filling it with your favorite wine. My thanks to all who responded.... its what I was hoping to hear. Does not require assembly, but I have found it does not accommodate all sizes of bottles — only slim ones. No assembly required, but the slots in the rack only hold Bordeaux-type bottles. No. It is ready to go out of the box. Will product 6312501 allow large pinot noir bottles to be stored? The "hole" dimensions should be close to 4" per bottle. How big are the "holes" in product 6312501? BEST ANSWER: With an height and width of 18 3/4", the holes of this product are approximately 3 1/2" wide. The opening is 3 1/4" . BEST ANSWER: It is not meant to be. No hardware or set up fro such. How many of these racks can be stacked? Is it stable with three units stacked (I am thinking of nine units, three across and three high)? Can the 25-bottle grid and 24-bottle X-Rack units be combined? BEST ANSWER: You can stack 3 high. They are different sizes so the diamond is larger so I would put that on the bottom. Does this wine rack store the bottles at a slight angle to prevent corks from drying out? BEST ANSWER: Yes your corks will be properly moist. 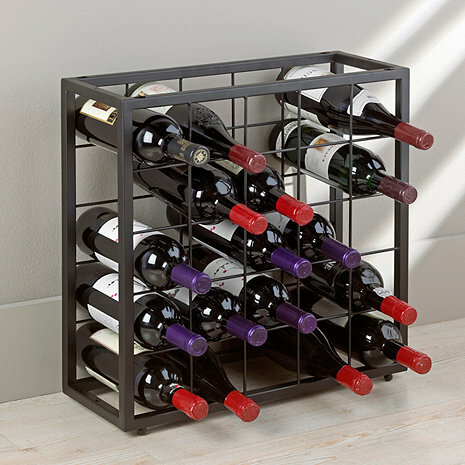 does the Black Steel Wine Rack come fully assembled? If I buy 2 and choose to stack them does the wine rack come with clips or something to attach them? BEST ANSWER: Thank you for your question, the units come shipped fully assembled. They can be mounted side by side, but the manufacture does not offer any type of clips. Adequate, but many bottles do not fit! These racks are clean stylish, and price-conscious, BUT the spaces only accept standard burgundy straight-sided bottles. It does not accept champagne or any bottle with any flare on the sides, or many heavier/wider bottles. So, as a general purpose wine rack, it is rather lacking. Beware. Although I measured before I ordered, the measurements listed on site were not accurate and this item did not fit in my cabinet. Also there are bump outs in the metal which also add to the dimensions, which are not accounted for in the measurements description. It costs almost as much as I paid for it to ship it back, so I guess I'm stuck with this. We needed more storage in a tight spot and were able to stack four of these crates and solve most of the storage issue! Having limited space for wine storage in my home, these racks fit perfectly in the cool crawl space under the house. Since they're made of metal, they won't provide a feast for termites that are native to this area. This rack fit very well in a narrow closet and neatly holds bordeaux size bottles. I bought two and four cases of wine are securely housed in a compact space. The rack does not fit our pinot noir bottles and this should be made clear in the advertising. In our area PINOT NOIR IS KING!!! We went on a trip to Napa/Sonoma and brought back a lot of souveniers, so we needed some wine racks to store them in our closet under the stairs. This was pretty much the only 25 bottle holder available on the internet, so we bought 2 of them because this product was one of the few that could fit into the space we had. 1. Not all of our bottles fit. We had some Pinot Noir bottles from a couple of wineries that were too wide. 2. $50 is a little pricey for what this actually is. 3. I wouldn't use this to display wine, but again it works for our closet. they stacked great as i bought two. needed more space in my smallish kitchen and this rack fits on the floor in a small alcove area- so doubles my wine strorage space- nice looking too! Item was back ordered and took several weeks. There was some confusion: 2 of 3 arrived, then 3 of 3 arrived a couple of days later. The confusion was I had to send an email to obtain the tracking # for the last unit. It is absolutely stunning to me that Wine Enthusiast would carry this wine rack. Epic fail on design. Not only does it not fit Pinot Noir bottles (as mentioned in a review -- which I ignored b/c I'm not a Pinot fan) it doesn't fit sparkling wine bottels, or ANY white wine from high end wineries. I go to Napa every year and like to collect 'special' bottles to savor later. No Chardonnay I picked up fits in this wine rack, nor Sauvignon Blanc. I gave it 2 stars because I like the simplicity of it, the fact it was stackable, and I could accommodate my nice Cabernets, so I did not return due to the hassle of shipping. Some normal size and shape US Pinot Noir and Cabs do not fit into the compartments. Thinking of returning this. We live in San Francisco, and we buy a lot of pinot when we visit the Russian River Valley of Sonoma. Many of these bottles don't fit the rack. I bought this to use in my basement for wine storage. Larger diameter bottles don't fit! How useless. I'm left with the same problem I had before. . bottles sitting on the floor. I would have returned it, but I had already threw out the box. Waste of money. I bought two stacked them and put oak top ...looks great. EXACTLY what I needed...very sturdy, openings just the right size, holds every bottle securely. Love it! We have a fairly narrow wine "nook" built into our basement, and these happened to fit it perfectly, leaving the brick wall behind them to show through. We stacked three together, and that perfectly complemented the space we have. The quality is excellent and the separate units bolt together very neatly. Great buy, assuming you're not looking for a more fancy-looking or elaborate storage system. The wine rack is simple in design and very well constructed. It does the job of storing wine very well. I like its simple look. As the need arises I will definetly purchase more of this rack. Excellent acquisition for my home. Have purchased two of these units which “hide” nicely beneath an ornamental table and keep table wines easily available. This product is great for auxillary or temporary holding of wine bottles. They are sturdy and good looking and fit in places where other racks do not fit. Not only do I give them the highest recommendation but I am going to buy more of them !! It is the perfect size, fits my room wonderfully, if I need more room I'll certainly order another one to stack on top of the one I have. My rack was delivered a couple days before the promised delivery date, in perfect condition. It was backordered and I had to wait several weeks for it, but it was worth the wait. Searched a long time for a sturdy rack to hold my “house” red and white wines inside a kitchen cabinet. Although this doesn’t hold magnum bottles or sparkling wines, it is perfect for my use. I’m very happy. Would have given 5 stars if it had a few sections that fit the larger bottles. A great easy to use wine rack. Stacks easy. Sturdy. Easy to connect multiple units. The only problem is that very fat bottles fit a little snug. Still a great buy. Very pleased. Burgundy (wider) shaped bottles don't fit this rack. Rather than having a capacity of 25 Bordeaux shaped bottles, I would have preferred a rack that accommodates fewer bottles including the wider Burgundy bottle as well. I buy my wine a case at a time (in a variety) and half the bottles in the case I bought yesterday don't fit in this rack. This item only takes standard bottles, not the larger Bordeau bottles.